Everything required to equip 6 firearms with strain gages for use with PressureTrace. 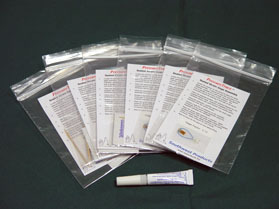 Includes 6 complete gage assemblies with instructions, connection plug, alcohol swabs, and one tube of glue. (These are constructed differently then the original black encapsulated gages. Gages are attached to a clear acetate film with plug firmly glued in location.